Acrylic on Panel - 24" x 16"
Originally done for the frontispiece of a special hardcover edition of THE VANISHING TOWER by Michael Moorcock. 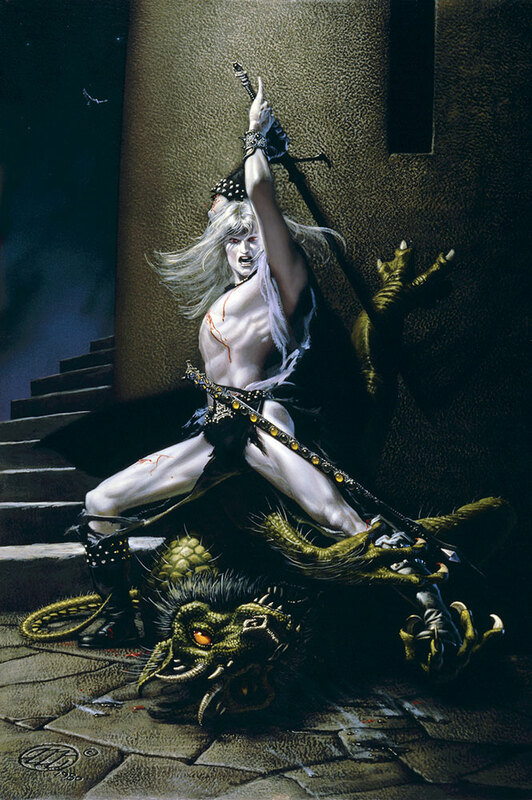 The swashbuckling and fantastic adventures of the moody albino prince -- Elric -- and his soul-drinking runesword, called Storm-bringer. The two are on a quest for The Vanishing Tower, which stands at the nexus of space and time and is a gateway into other dimensions. Elric must conquer the demon that inhabits the tower and tame the soul of his black runesword.This tale and its heroes weave in and out of events throughout Moorcock's Eternal Champion series.